The Seattle Seahawks are not far removed from a period of unquestioned success. They made five straight playoff appearances from 2012-2016, winning three NFC West titles, two NFC Championships, and a Super Bowl along the way. But things change fast in the NFL. Seattle missed the playoffs in 2017, and after a rough offseason and a Week 1 loss in 2018, we don’t see 2018 shaping up any better for the Seahawks. In fact, it’s looking much worse. Seattle has made Russell Wilson their man. On the one hand, that’s understandable. He’s a franchise quarterback who’s already won a Super Bowl. He should be the player that the team is built around. On the other hand, the Seahawks have actually built around Wilson about as well as MLB’s Los Angeles Angels have built around Mike Trout. Aside from Doug Baldwin (who’s hurt), there’s no reason to have any confidence in Wilson’s receivers. A quarterback needs receivers to create some separation. That’s something that this team lacks in a big way. Now, a quarterback like Wilson can mask some of those problems. He moves around incredibly well in the pocket and can buy time for his guys. He may not have Antonio Brown or Julio Jones to throw to. But if everything else is right, Wilson is the kind of quarterback who can make bad receivers average, average receivers good, and good receivers great. Unfortunately, everything else is not right. In fact, everything else is wrong. Duane Brown is a fine left tackle. But the rest of this offensive line is a mess. 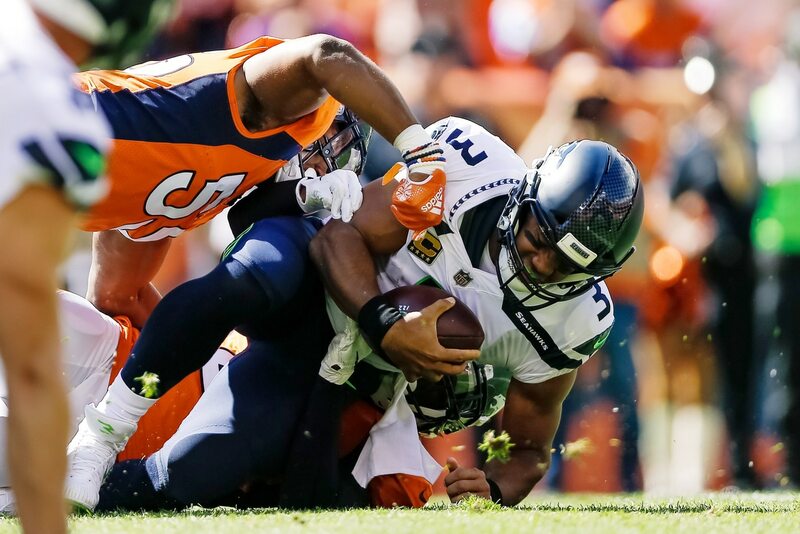 We saw it against Von Miller and the Denver Broncos in Week 1 when Wilson was sacked six times. In Week 2, the Seahawks are rolling into Chicago for a date with Khalil Mack and company. It doesn’t figure to go much better. As good as Brown is, teams can avoid him. Defensive coordinators are going to draw up game plans that have their pass rushers attacking away from Brown. Even without players like Miller or Mack, right tackle Germain Ifedi and the rest of the line will be quite vulnerable. When they go against elite pass rushers, they’ll be helpless. This is a long-term problem that goes back more than two years. The Seahawks have relied on Wilson to do too much. As mobile as he is, Wilson is still taking way too many hits. Thus far, he’s avoided the serious injury. But as he gets older and takes more hits, he’s going to slow down. As that happens, the risk for the big injury only gets greater. This team’s situation isn’t great with a healthy Wilson. Imagine what happens if something happens to him. Now, this might seem a touch pessimistic. After all, as good as Wilson was, he wasn’t the only reason that the Seahawks won. We’d buy that idea, but there’s one problem, and it’s glaring. Richard Sherman is gone. Kam Chancellor is gone. The same can be said for the likes of Marshawn Lynch, Michael Bennett, Bruce Irvin, and so many of the players who were key parts of Seattle’s championship era. It also might seem like we’re picking on the Seahawks here. Yes, they’re in trouble if Wilson goes down. But isn’t that the case with just about every other team in the league? Very few (if any) could survive the loss of a starting quarterback. The problem is that most other teams actually build around their quarterbacks. They at least attempt to give their quarterbacks adequate blocking and decent receivers to throw to. Seattle has turned a blind eye to both problems for a long time. Wilson is clearly the man in Seattle. But saying someone is the man and actually building around him are two different things. The Seahawks have done the former. The latter is a much different story. As such, we’d advise Seattle fans to hold on tight to the memories of the championship era. Remember Richard Sherman swatting Colin Kaepernick’s pass away from Michael Crabtree, into the arms of Malcolm Smith. Don’t ever forget the absolute destruction of Peyton Manning’s Broncos two weeks later. Remember the dramatic NFC Championship Game comeback against the Green Bay Packers. Remember everything about the final drive against the New England Patriots in Super Bowl XLIX…but try to forget the last play. That era of football is over in Seattle. Things are bad now, and they’re only going to get worse.